Keratea is a town of 16,000 residents in Lavreotiki municipality, situated in southeastern Attica, 40km from Athens, near Lavrion. The site has an ancient history that has left many remains, an amphitheatre, parts of the ancient fortification, etc. As many parts of Attica, it has also a strong Arbanitic tradition, which highlights values such as extended family solidarity and social cohesion against a usually alienated authority, as well as a sense of pride and putting head to a cause. Most residents are small farmers (wine, olives, etc. ), workers and/or unemployed, retired. During the last decade, after the construction of the international airport at Spata (2001), and also Lavrion and Rafina ports development to unburden Piraeus’ heavy traffic, eastern Attica suffered a sort of gentrification with Athens recreational, touristic and construction firms moving eastern (this movement can be tracked by almost annual forest fires, taking care of what’s left of Attica’s ‘unexploited’ space). Of course, infrastructure and any kind of social services (even proper sewage systems) remain significantly inadequate. The suggested creation of a huge open dump would be the top of the iceberg – or the mountain of garbage – to the complete subjugation of the territory and its people to private profit, as a dangerous and typically illegal ‘solution’ to the garbage disposal problem of all Attica is proclaimed against the will of those that will have to suffer it, and once they make clear their disagreement, they are violently repressed. No time for the old days’ ‘negotiations’ in the socialist government’s ‘fast track’ capitalism. 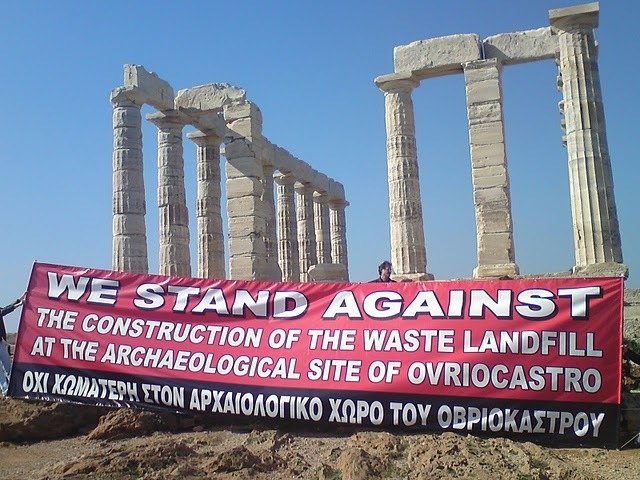 The issue of dump constructions and garbage disposal in general has given birth to diverse militant struggles held in different parts of Greece these last years, with most significant the ones in Grammatikon (northern Attica), Neraida-Serres, Varnavas, Naxos island, Karvounari, Elliniko-Ioannina, and of course Leukimmi, Corfu, where a small village manages to block the construction works and confront the police by all means for three years now, having one woman dead to the police violence, and many facing charges. ATHENS, Greece (AP)— Riot police fired repeated volleys of tear gas Tuesday to push back firebomb-wielding residents of a town near the Greek capital in the latest violence over plans for a garbage dump in the area. 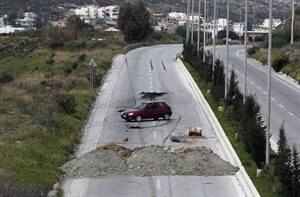 The extensive clashes in Keratea, some 40 kilometres (25 miles) south of Athens, began Tuesday morning, when protesters set fire to a bulldozer sent to clear roads they had blocked for more than a day with rubble. In pitched battles fought across rural roads and in fields on the outskirts of the town, hooded and masked protesters hurled rocks and dozens of firebombs at lines of riot police as evening fell, and threatened the few journalists covering the violence. Police said four officers were injured in the clashes. Authorities called in bulldozers to clear road blocks set up by the protesters. The clashes in Keratea were the latest in a series of violent demonstrations against the plans to set up a dump in the area. Keratea residents have been involved in running clashes with riot police for much of the past three months, arguing the dump will degrade their area and damage local antiquities. So is the aim of the latest war a noble one? How do Cockburn and Johnson know? An engaging discussion with the cast of La Commune (Paris, 1871) a 5 hour docudrama, directed by Peter Watkins about the Paris Commune. 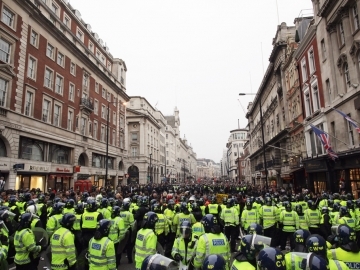 About half a million people marched through the streets of central London to protest against government spending cuts.